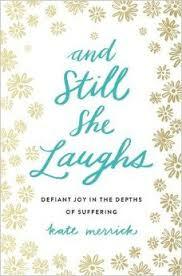 Kate Merrick examines the Bible’s gritty stories of resilient women as well as her own experience of losing a child—a journey followed by more than a million on her beloved blog, prayfordaisy.com—to reveal the reality of surprising joy and deep hope even in the midst of heartache. Merrick digs deep into the fact that our culture equates being loved by God by being blessed by Him by receiving the life we ask for. It's the type of thinking that leads so many people to discontentment, and sadly leads people astray from God Himself. If our lives are rough we must not be loved by Him, if our prayers aren't answered in our ways we must not be blessed. While in reality the Bible points out that we must "take up our cross daily" and that the path of a Christian is narrow and hard but that the rewards are worth it. THIS is what Merrick comes to realize while searching the Bible and stories of hardship and pain.